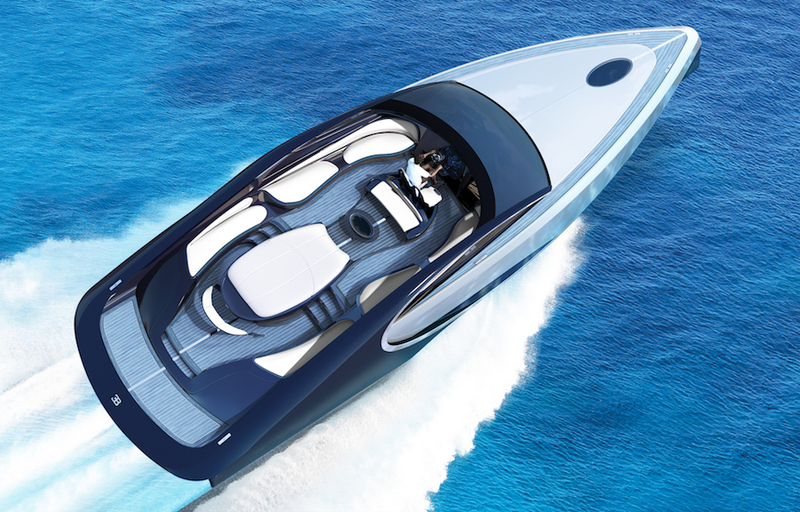 Palmer Johnson's innovative hull form and use of advanced materials like carbon have been combined with Bugatti's signature design traits to create a next generation sports yacht. For the owners of tomorrow, the Bugatti Niniette 66 lifts your expectations of life even higher. A shallow draft means cruising the transparent waters of the Caribbean is possible for the weekend, and at a speed of 44 knots, getting you there in no time at all. Alight onto a sumptuous open deck of captivating shapes borne of ingenuity and daring design with the singular quest to uplift your spirits and sharpen your senses. Tiered lounges beckon, hand-crafted in sweeps and curves for stunning visual appeal and maximum space. Two social areas are evident, distinct but still connected. The jewel in the crown is the combined Jacuzzi, sundeck and champagne bar, which anchors and fluidly connects both areas. And just when you thought you had it all, the forward seats flair up to frame a centrepiece fire pit, which adds a fresh perspective to the pleasures of yachting. Combining the innovative hull design, signature engineering and master craftsmanship you would expect of a Palmer Johnson, with the purity of design and perfect proportions of a Bugatti. A timeless icon.